Where do I start?! I have spent the last 4 days at the Gathering of Friends and it has been beyond amazing. I confess I am not even sorry for not posting much about it, because I have been busy enjoying it too much. So many highlights to share. Where do I start?! Today, I played a prototype copy of Spyrium designed by William Attia (maker of the great game Caylus - basically the best classic heavy euro game of all time). You can see a picture of us above. First off, the game is amazing! It does everything I love in games. Its deep, with tough decisions and never enough turns to make them all. Every turn is fun, and even in your downtime you are engaged and care what other players are doing. However, this was not the highlight of my interaction with William. Later I found out that he is also keeping an eye out for games for Ystari publishing AND he wanted to see my game Londonderry that I co-designed with Stephen Sauer. WHAT?! We played the game and it was tons of fun. Thanks to Gord Hamilton & Ian Mackey for joining us. 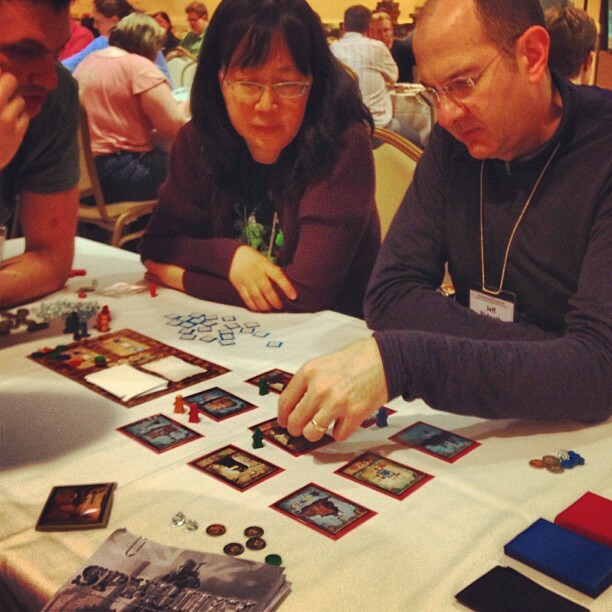 William expressed Londonderry is not necessarily his taste in games, but offered great feedback and encouragement. My bias but favourite comment after he found out I liked the game "Rialto" by Stefan Feld, "well I can tell why you like that game because this game reminds me of it very much, but I like your game more." After I came back down from cloud 9, William spent a significant amount of time sharing his story, talking about his progress as a board game designer. It was so amazing to hear a candid and personal story from such an accomplished designer about his journey. From a simple beginning of organizing a Puerto Rico tournament in game store in Paris, meeting the shop owner that hosted the tournament, becoming friends, helping him develop a game called Ys, which lead to his friend starting Ystari board game company, to initially starting to design Caylus in January 2005 and having it out in print by October 2005. And still today most would say its the greatest worker placement game ever designed. I doubt Londonderry will get published by Ystari, but after such an amazing experience meeting William, and hearing about all the care and development Ystari puts into their games, I must confess I really hope some day I have the honour and privilege to work with them in the future. They sounds like a great company that cares about games and wants to work to make the best products possible for their customers. And you can tell when you play Spyrium, it is amazing. I plan to buy that game. And every person I have at GoF who has tried the game, is planning to buy the game too. Its that good! Awesome experience, Daryl! Yeah, I think every Ystari game I own is an absolute winner - Caylus, Yspahan, Metropolys, the list goes on. I look forward to trying more. Sadly I have only played Caylus (many times - amazing) & Yspahan (one of my favourite games).